At Goudy Elementary, in Uptown, 75 first-grade students have been working with Engineering Lab teacher Patty Whitehouse and CAPE Teaching Artist Margy Stover to design walls that bring people together instead of keep them apart. 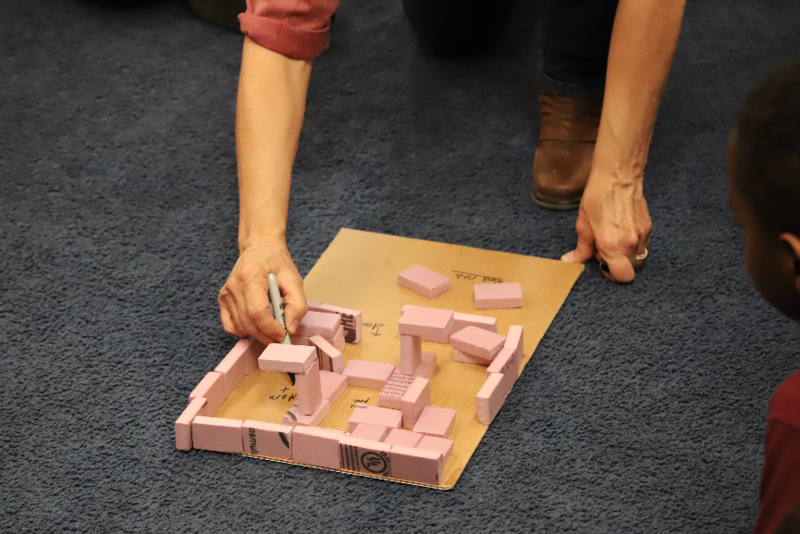 The students have been planning and working in groups to construct small-scale models of “friendly walls” that incorporate fun and inviting features like swimming pools, trampolines, slides, and windows for waving hello and shaking hands. The Goudy first graders recently welcomed a group of high school students from Williams Preparatory School of Medicine in Bronzeville, where Margy Stover also teaches a CAPE class with Williams Prep’s art teacher, Phil Cotton. 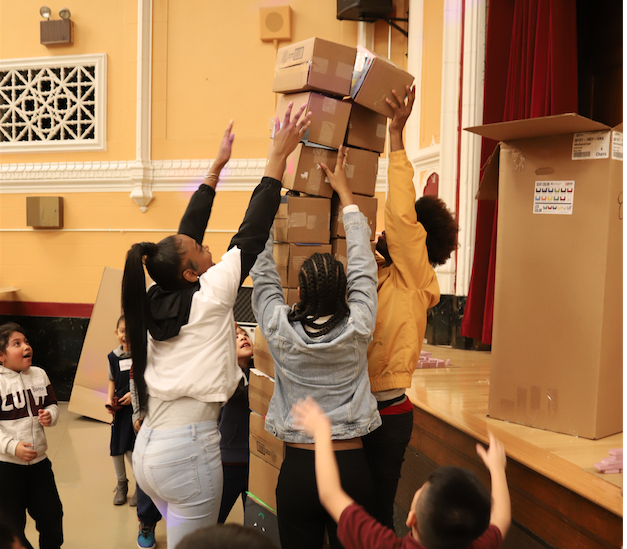 The two schools have been exchanging letters for months about their lives and neighborhoods, and the Williams students came up to Goudy to help their young pen pals build large-scale versions of their friendly walls models. Working in small groups, the first graders directed the “big kids” in the building of some very complex, silly, and tall walls. Using 300 “blocks” constructed and decorated by the first graders, friendly walls were built, and friendly walls came tumbling down amidst peals of laughter. After several rounds of building, all the students headed outside to enjoy the sunny day and then eat lunch together before the Williams students boarded their bus back to Bronzeville. Asked about the experience later, the Goudy students were still giddy when describing how much fun they had with their new high school friends. 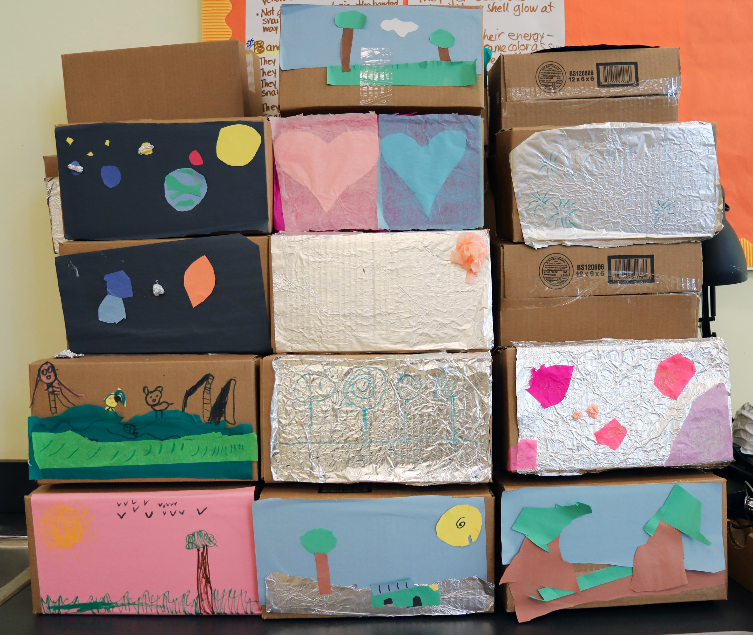 We are so proud to support projects like this one, that help students consider and address complex personal and societal issues by creating art and building relationships that span age and distance. This project and others from our Artist/Researcher Partnership program will be on display in May and June as part of our Convergence exhibition.